Children of all ages can benefit from mindfulness, the simple practice of bringing a gentle, accepting attitude to the present moment. It can help parents and caregivers, too, by promoting happiness and relieving stress. Here, we offer basic tips for children and adults of all ages, as well as several activities that develop compassion, focus, curiosity and empathy. And remember, mindfulness can be fun. Adversity comes at us from the moment we are born. Infants get hungry and tired. Toddlers grapple with language and self-control. And as children develop through adolescence to become teenagers, life grows ever more complicated. Developing relationships, navigating school and exercising independence — the very stuff of growing up — naturally creates stressful situations for every child. At each developmental stage, mindfulness can be a useful tool for decreasing anxiety and promoting happiness. 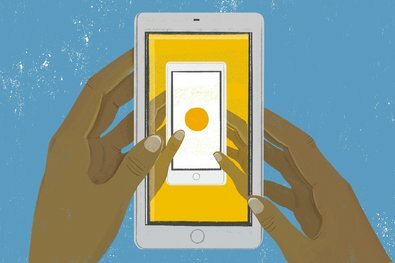 Mindfulness — a simple technique that emphasizes paying attention to the present moment in an accepting, nonjudgmental manner — has emerged as a popular mainstream practice in recent decades. It is being taught to executives at corporations, athletes in the locker room, and increasingly, to children both at home and in school. 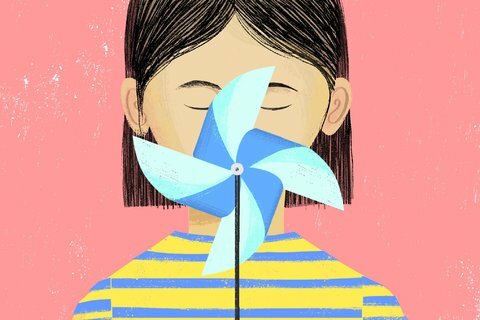 Children are uniquely suited to benefit from mindfulness practice. Habits formed early in life will inform behaviors in adulthood, and with mindfulness, we have the opportunity to give our children the habit of being peaceful, kind and accepting. Part of the reason why mindfulness is so effective for children can be explained by the way the brain develops. While our brains are constantly developing throughout our lives, connections in the prefrontal circuits are created at their fastest rate during childhood. Mindfulness, which promotes skills that are controlled in the prefrontal cortex, like focus and cognitive control, can therefore have a particular impact on the development of skills including self-regulation, judgment and patience during childhood. Mindfulness isn’t something that can be outsourced. For parents and caregivers, the best way to teach a child to be mindful is to embody the practice oneself. Of course, being a parent is an incredibly stressful experience in its own right. 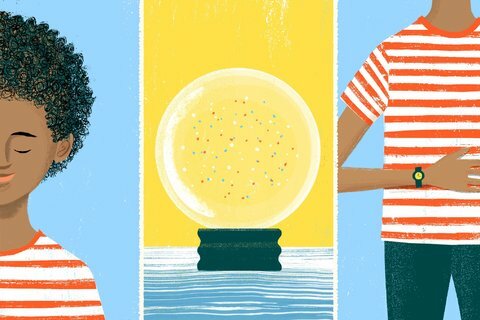 For those raising children, practicing mindfulness exercises — and ideally practicing mindfulness meditation for even a few minutes a day — can be profoundly beneficial, allowing caregivers to not only share the skills of happiness and acceptance with a new generation, but also take better care of themselves at the same time. Meditation is a simple practice available to all and can reduce stress, increase calmness and clarity, and promote happiness. This guide offers basic tips to get you started on a path toward greater equanimity, acceptance and joy. 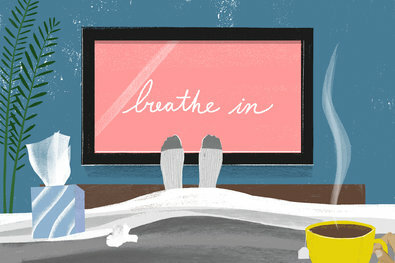 There are many apps, classes and books to guide children in meditation, but it is easy (and free) to start at home. Meditative practices have the potential to actually change the structure and function of the brain. Young travelers need to chill out, too. Resorts may offer meditation sessions, some with yoga, to help. Even the youngest children can sense distraction. So work on being present. During the first year of life, the most effective way to share mindfulness with a child is to embody it. Children are hungry for our attention and affection, and can sense when parents or caregivers are distracted. So when you are with an infant, try to stay in the present moment no matter what is happening. Smartphones are popular, but distracting. Mindfulness teachers encourage parents and caregivers to put down the phone and engage with a baby, even if it’s simply making eye contact and smiling. “Instead of scrolling through email, put down the device and be fully present and attentive,” said Ms. Kim. For parents or caregivers who find themselves upset and out of touch with the present moment, a popular mindfulness exercise known as S.T.O.P. can be helpful. Stop. Just take a momentary pause, no matter what you’re doing. Take a breath. Feel the sensation of your own breathing, which brings you back to the present moment. Observe. Acknowledge what is happening, for good or bad, inside you or out. Just note it. Proceed. Having briefly checked in with the present moment, continue with whatever it was you were doing. If you find your mind wandering, one way for parents to re-engage with mindfulness is to move, either performing gentle yoga when the baby isn’t being held, or trying out a walking meditation. 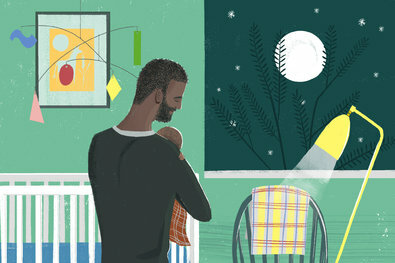 For parents with infants, it can be useful to cultivate a sense of gratitude. This exercise, like others in this guide, is adapted from “Mindful Games,” an activity card set created by Ms. Greenland and Ms. Harris. First, find a space where you can safely and comfortably walk indoors while holding your child. If you’re not feeling particularly happy, that’s okay. The point of this exercise is not to magically feel better. It is to experience the sensation of moving and to focus your attention on the sensation of holding a baby and walking, and to focus on the feeling of gratitude. Holding the baby safely and then turn your gaze downward and begin walking slowly and deliberately. Notice the feeling in each foot as you step. Do you feel the heel of your foot, the ball of your foot and your toes? Parents naturally feel a range of emotions when holding a child, from deep love to being intensely overwhelmed and anxiety. If paying attention to your body makes you uncomfortable for any reason, you can try listening to sounds as you walk instead. Simply listening to the orchestra of sounds while walking slowly — from the rustling of your clothes as you move, to singing birds, to the everyday activity of your home — can be a calming break from the constant caretaking required for an infant. May we sleep well soon. May this exhausting time together make our bond stronger. May we have compassion for each other. As you turn around and retrace your steps, think of the ways your life is better because of your child and continue the exercise. Remember that at times, infants and caregivers can co-regulate. If a caregiver is feeling agitated, his or her walking slowly and deliberately, with a focus on something other than the baby being upset and worrying about how he or she will get the baby to calm down, will settle the caregiver, which in turn may help regulate the baby. Remember that whatever state of being that your baby is in at any particular moment, it is not a permanent condition. Raising children between the ages of 2 and 4 can be incredibly rewarding and immensely challenging. Don’t look at your phone too often when your children are around. Spend time doing activities that promote focus, creativity and inquiry — such as reading, making art and having conversations — rather than watching a lot of TV. Treat other people — especially your children — kindly, even when you are frustrated and upset. And express gratitude for the things in your life you feel thankful for. Even with the best of intentions, raising toddlers isn’t easy. The exercise described above, known as S.T.O.P., can be helpful in challenging moments. In addition, getting to know our bodies is an essential part of mindfulness practice. This starts with our breath. 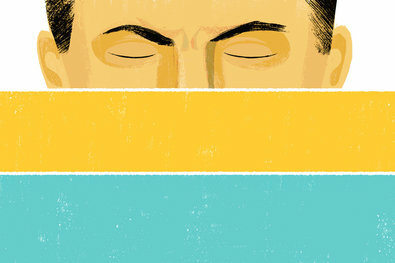 Breathing exercises can help you become more familiar with the rhythms of your body. Try this one and, after, think about how it might be useful in your life — maybe when you’re tired, or when you’re feeling worried about something? This exercise allows us to see how different ways of breathing affect how our mind and bodies feel. This short guided meditation by Annaka Harris teaches children to see in new ways, using a small stone or rock as a window into the present moment. Don’t make mindfulness seem like something only to be used in times of trouble — present it as a tool to be used in a variety of situations. As children develop into early childhood, they become capable not only of practicing mindfulness with the guidance of a parent or caregiver, but also of retaining some of these skills and turning to them in times of need. “By around age 4 they are able to learn skills that they can utilize on their own,” said Ms. Greenland. To instill these habits in children, practice is key. Don’t make mindfulness something that is turned to only in times of stress. Instead, make mindfulness exercises a regular part of the daily routine, an activity in and of itself, just like reading, playing outside or making art. And rather than making mindfulness seem as if it is only as an antidote to irritating situations, present it as a tool that can help children explore new sensations, including those that are pleasant, neutral and unfamiliar. A glitter ball can help us understand the connection between mind and body. As children grow older and become more independent, parents and caregivers grapple with a loss of control. When children are in school and out with friends, there’s simply less a parent can do to influence the lives of their children. And when setbacks occur, as they inevitably will, it is important for parents to meet those misfortunes with mindfulness. Rather than getting hung up on whatever the problem is, note it and address it, but at the same time recognize that it is fleeting and will pass. If it is the child who misbehaved, make an effort to forgive them. This short guided meditation by Annaka Harris focuses on the breath and is designed for children ages 6 to 10. A longer version, intended for children who have had some practice, is available on her website. 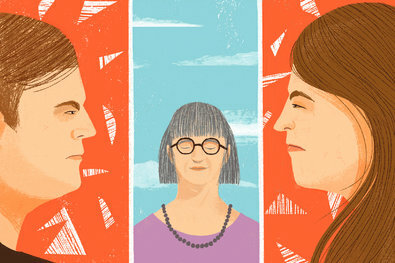 Use the experience of your kids arguing as an opportunity to choose a more mindful response in the face of conflict. The things I take from mindful parenting sources are the things I consider truths. Research suggests meditation and mental exercises may be better than drugs at helping people cope with attention problems. Children can benefit from mindfulness to adjust as they move through school — and start to experience a wider world. 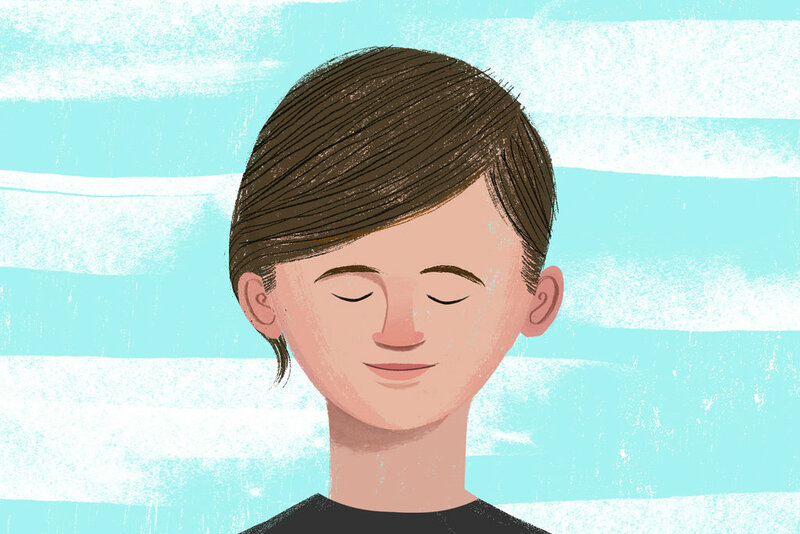 At this age, mindfulness practice can also help children in school. A recent study found that fourth and fifth graders who took a four-month meditation program demonstrated improvements in cognitive control, working memory and math test scores. Other studies have shown that mindfulness can be especially helpful to children with attention deficit hyperactivity disorder, and also reduce children’s aggression, anxiety and stress. And around the country, many educational institutions — from elementary schools to graduate programs — are bringing mindfulness training into the classroom. 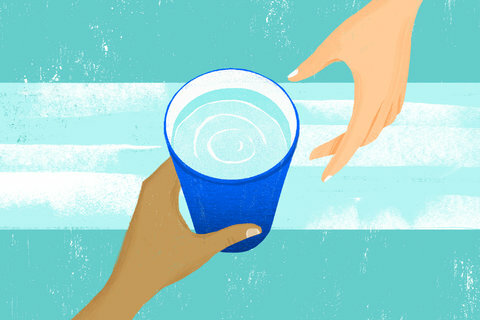 By passing a cup full of water without spilling a drop, we can cultivate attention and learn about teamwork. Even with mindfulness, parenting can still be a challenge. As children experience the natural highs and lows that are part of growing up, it is all too easy — even natural — for the parent be buffeted by the child’s emotional roller coaster. But in time, mindfulness practice can relieve parents and caregivers from some of the pressure of identifying with every up or down the child experiences. A simple exercise, known as R.A.I.N., can help us stay in the present moment and not get caught up clinging to the experiences of others, or our own emotions. R: Recognize. Acknowledge what is happening, just noting it in a calm and accepting manner. A: Accept. Allow life to be just as it is, without trying to change it right away, and without wishing it were different somehow. I: Investigate. See how it feels, whether it is making you upset or happy, giving you pleasure or pain, just note it. N: Non-Identification. Realize that the sensations you are feeling make for a fleeting experience, one that will soon pass. It isn’t who you are. 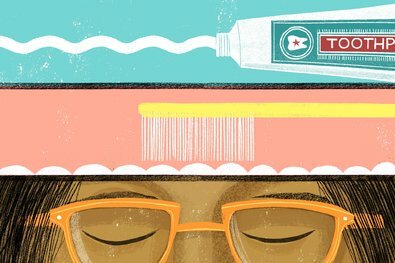 Though evidence is thin on how well mindfulness and meditation might work at school, the use of inward-looking practices in the classroom is growing. 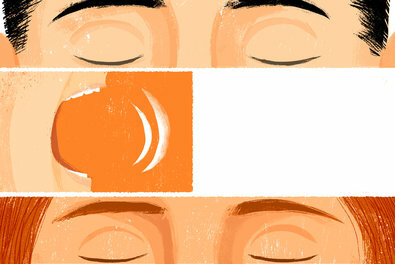 Meditation can help instill self-control and an ability to focus. 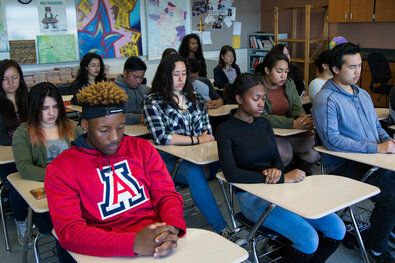 When a troubled school taught students Transcendental Meditation, suspensions dropped and attendance and students’ grade point averages rose. 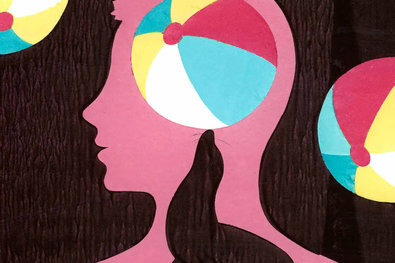 Teenagers can experience mindfulness in much the same way as adults, but they may also show resistance or frustration with the practice. For teenagers, one of the most important ways to engage with mindfulness is through a focus on relationships: Bringing a mindful attitude into conversations, friendships and even budding romances. “Relational mindfulness becomes a very important part of the practice,” said Ms. Greenland. In each relationship, and even each interaction, there should be an effort to stay present, listen carefully and speak with honesty and kindness. Also, try to minimize distractions by putting phones and other devices away during mealtime. And try to share a moment of silence before you eat, taking time to be grateful for the company of your family. 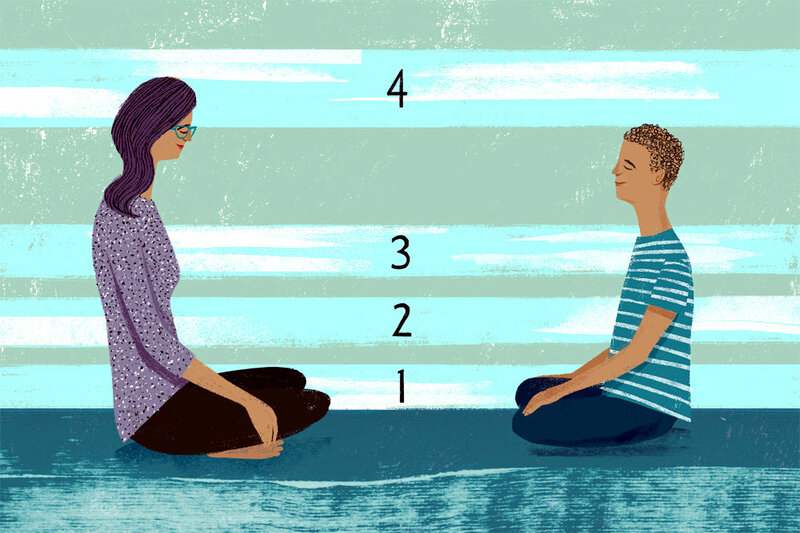 For parents, too, this can be a challenging time to practice mindfulness with children. After all, if a teenager is lost in his or her smartphone, what does it matter if the parent is surfing the web, too? But that’s exactly when the parent needs to be mindful the most, modeling good behavior for their child — staying kind, compassionate and accepting in the present moment. 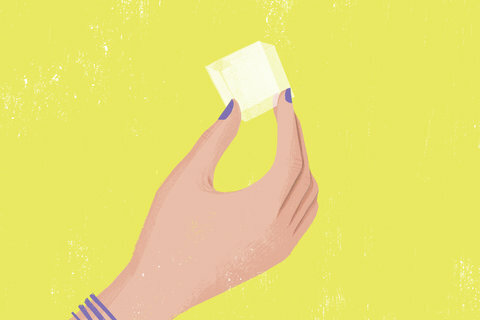 Holding a cube of ice can help us learn the difference between a feeling and a reaction. This short guided meditation by Annaka Harris focuses on developing compassion, as well as concentration and awareness. Impulsively checking your phone? Take a moment with your own thoughts instead. Turn a twice-daily chore into a moment of reflection. 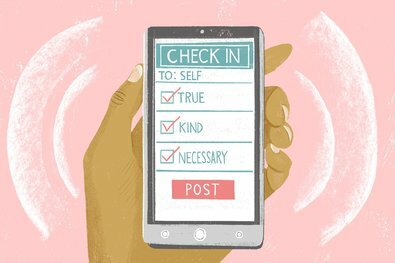 Take a moment before you log on to your phone or computer to evaluate your intentions. Staying mindful during an argument allows us to choose conversation, discourse and debate in ways that do not escalate the situation. Anger can be a natural, life-affirming emotion, if you let it be. Here’s a selection of our favorite books about mindfulness for kids and parents. Authored by Myla Kabat-Zinn and her husband Jon, the founder of mindfulness based stress reduction, this is a comprehensive guide to mindful parenting. Written by Ms. Greenland, this is a helpful guide for parents that includes techniques to help children develop mindfulness. Created by Ms. Greenland and Ms. Harris, this activity card set was the inspiration for several exercises in this guide. This book, written by Eline Snel, features exercises that can help children deal with anxiety, improve concentration and handle difficult emotions. Thich Nhat Hanh, a Zen monk, wrote this guide for parents who want to introduce their children to mindfulness and meditation. A comprehensive guide to mindfulness for parents and children by Ms. Kim, this three-volume set includes a study guide for parents, lesson plans for children and an activity book. 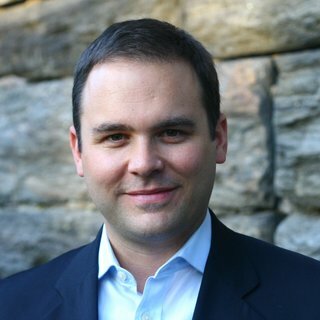 David Gelles is a reporter for The New York Times and author of “Mindful Work: How Meditation Is Changing Business From the Inside Out.” He has been practicing mindfulness and meditation for nearly 20 years.